One of the best commercial print marketing tool used by companies nowadays are rack cards. Its primary objective is to convince the customer about a certain product or a service, evoke interest in them so that they can come forward and buy them, resulting in profit to the business. They are extensively seen in tours & travel companies, restaurants, hotels, guest houses and cafeterias. They are stylish and multipurpose product. These cards are self sufficient and enough for beautifully explaining your product, or services to your potential customer through attractive photographs and right words. 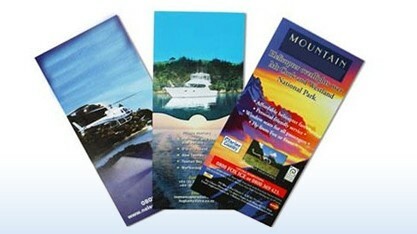 It is important to choose a company that has good rack card printing experience. S S Graphics is the first name that comes up when talking about industry experience. With over 18 years of experience, we are surely one of the most reliable names in rack card printing and the obvious print industry leaders. Our innovative designs and supreme quality printing will give you a definite edge over your competitors. We offer customized rack cards and full color rack cards that are a treat for eyes. We have thousand of design and templates that you can choose, and we will gladly customize it. We use the most advanced rack card printing technology that help us to even print small quantities of card at a reasonable cost. Rack Cards Printing is Easy! Rack Cards are highly effective as promotional or advertising materials commanding immediate attention of the visitors thereby enticing them to buy your product or service. Rack Cards can be used as informational flyers with menus at hotels, rest stops, restaurants, , location maps or reservation forms at the airports. Rack cards should be printed with bold colors and graphics thereby claiming attention of the visitors. They may be perforated or folded as per your requirements. While designing a rack card and finalizing its size ,one should always take in account the area where it is to be used for advertising to make it even more attractive . Size : Choose an Option... 3.5" x 8.5" 4" X 9"